I am using it for about 30 years, but it is strong and durable for long. Do you think the price is affordable? This review is about item#5749974. As a drive chain inside the machine. 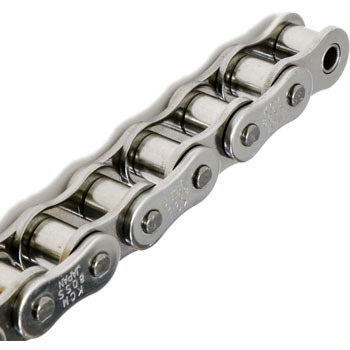 Stainless chain is necessary because it is immersed in acidic or alkaline chemicals, but the size does not match in the case of repair and replacement at the time of repair and replacement. Since this product is long, cut it to the necessary number of frames by itself and use regular parts There is no need to prepare many kinds and it is saved. This review is about item#35274933. Processing can also be done smoothly and it is excellent also in quality. It was even better if the ordering unit could be made in a little short unit. This review is about item#05749965. This review is about item#05749983. Write down if you have a joint link !! This review is about item#05749992. This will be your second purchase. Although it is certainly troublesome to replace the parts, cost reductions come true by being able to do it by oneself. We are planning to purchase other parts here as well.